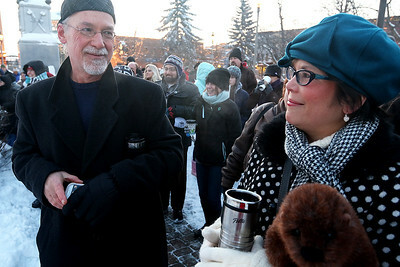 H. Rick Bamman - hbamman@shawmedia.com New Woodstock residents Gary and Suzanne Leclair were part of the crowd that gathered on Monday morning on the Woodstock Square for the Groundhog Day Prognostication. H. Rick Bamman - hbamman@shawmedia.com Frank Jay's trio, from left Tony Hermanek, Bill Jeffrey and Mike Delaney play for the crowd that gathered Monday morning on the Woodstock Square for the Groundhog Day Prognostication February 2, 2015. H. Rick Bamman - hbamman@shawmedia.com Handler Mark Szafran presents Woodstock Willie to the crowd that gathered Monday morning on the Woodstock Square for the Groundhog Day Prognostication February 2, 2015. Willie prognosticated six more weeks of winter after seeing his shadow. 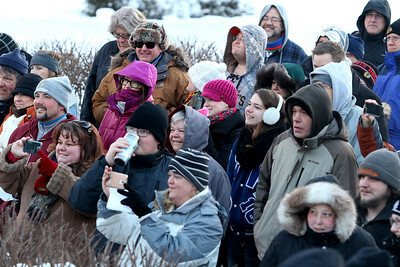 H. Rick Bamman - hbamman@shawmedia.com A crowd gathered on Monday February 2, 2015 morning on the Woodstock Square for the Groundhog Day Prognostication. 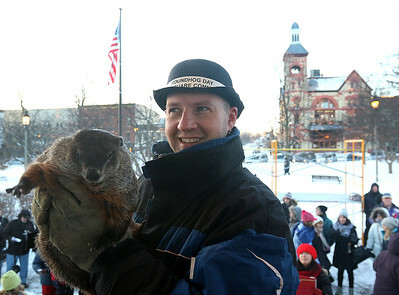 H. Rick Bamman - hbamman@shawmedia.com Handler Mark Szafran presents Woodstock Willie to the crowd that gathered Monday morning on the Woodstock Square for the Groundhog Day Prognostication February 2, 2015. 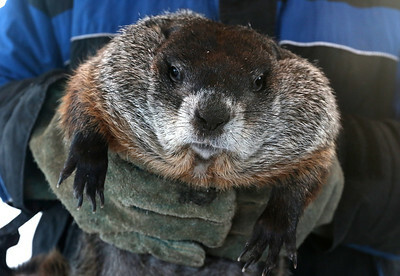 Willie prognosticated six more weeks of winter after seeing his shadow. After the "seer of all seers" signaled an extended winter, the crowd dispersed to local restaurants and businesses to enjoy the last day of a weeklong celebration. 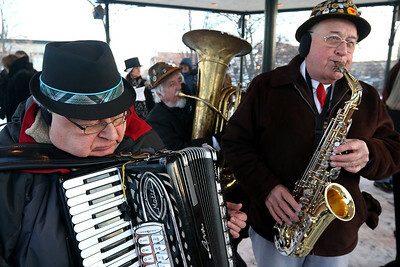 Frank Jay's trio, from left Tony Hermanek, Bill Jeffrey and Mike Delaney play for the crowd that gathered Monday morning on the Woodstock Square for the Groundhog Day Prognostication February 2, 2015.